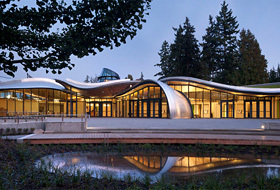 Glass facades and the undulating roof hightlight the extravagant appearance of the VanDusen Visitor Centre even from afar (source: Raymond Chan). The VanDusen Botanical Garden aims to demonstrate to people the meaning of biological diversity and the value of sustainability. The cascade-like garden around the new Visitor Centre has a series of different ecological zones, just as they exist in this region on the Pacific coast: wetlands, forests and meadows. Each bench, stone and plant has been sourced locally. The various spaces and pathways enable the visitors to enjoy nature while gently leading them towards the Visitor Centre. The interior of the centre is immediately visible thanks to its glass walls and the building appears to spring directly from its surroundings. The Visitor Centre is a model of sustainability and environmental protection for our 21st Century. It provides a vibrant meeting place where the visitor can source information and find inspiration and enthusiasm for the plant world. Drawing inspiration from the organic shape of the orchid, the entire roof is designed as a number of undulating surfaces, representing the petals, which run off seamlessly into their surroundings at ground level. The pitch and curves of the roof areas range from 2° to 55° and were a considerable but not impossible challenge in terms of the actual wooden roof construction. 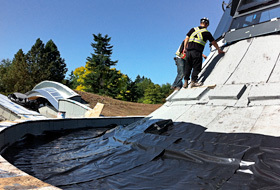 A leakage-detection system was installed in the wooden roof, followed by a double-layer, root-resistant bitumen waterproof membrane. 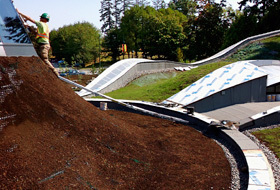 ZinCo expertise was in demand for the green roof as the differing roof pitches had their own individual requirements for example in terms of drainage, irrigation and shear force. ZinCo provided a solution for these issues by using three different system build-ups: the irrigation and protection layer BSM 64 was installed across the entire roof area. 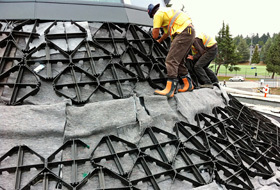 Contractors Houston Landscapes then installed the system build-up with drainage and water storage element Floradrain® FD 40 in those areas with a roof pitch of up to 10°. They installed Floraset® FS 75 elements in the areas with a roof pitch of up to 25° and Georaster® elements which are specifically intended for steep-pitched roof areas of up to 55°. The issue of additional irrigation for pitched roofs during dry periods is becoming increasingly significant. 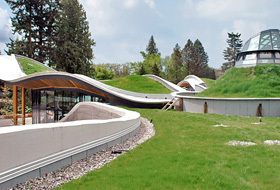 However, due to the choice of plants and the prevailing micro-climate given the proximity to the coast, permanent irrigation is not required for the VanDusen Visitor Centre. Vancouver with 166 days of rain and precipitation of 1181 mm a year is considered to be a very rainy city. It experiences almost twice the level of precipitation as Stuttgart, for example. The Visitor Centre has already been awarded the LEED Platinum Standard for environmentally-friendly and sustainable building. In addition, the concept and design of the Visitor Centre complies with the stringent requirements of the Living Building Challenge LBC Standard. This is the most challenging appraisal system for “Green Building” with strict guidelines such as, the building must meet its own energy requirements with locally-sourced, renewable energy. 100 % of the water needs must be met by means of rainwater harvesting and chemical-free water preparation. Water purification is biological thanks to the plants. 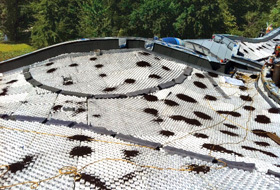 The bio-reactor is the first of its kind in Vancouver. Other requirements of the LBC Standard concern various aspects of healthy living such as the materials used or designing with light and greenery. 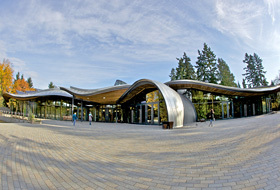 Top level sustainability and environmental protection has been achieved with the VanDusen Visitor Centre as it complies with this standard – a tangible model for the 21st Century.